(Nanowerk News) Modern catalytic converters for the treatment of exhaust gases in vehicles with a combustion engine have largely contributed to reducing of pollutant emissions. By oxidation or reduction, i.e. the donation or acceptance of electrons, the catalysts convert combustion pollutants, such as carbon monoxide, nitrogen oxides and hydrocarbons, into carbon dioxide, water, and nitrogen. Increasingly strict emission regulations call for a further reduction of fuel consumption and for an efficient use of the exhaust gas aftertreatment system. When adding the reduction agent ammonia formed by e.g. decomposition of urea, nitrogen oxides are converted into harmless nitrogen and water vapor over the catalytic converter. For this purpose, typically an urea solution (AdBlue®) is injected into the exhaust gas section upstream of the catalytic converter. To improve catalytic converters, it is required to precisely understand their function and the individual reaction steps. "Reliable findings relating to the reactions taking place may only be obtained under close-to-reality conditions," Professor Jan-Dierk Grunwaldt, Holder of the Chair for Chemical Technology and Catalysis of KIT, says. "This means that we have to watch the catalytic converters at work. Synchrotron radiation sources are perfectly suited for this purpose." Synchrotron radiation is electromagnetic radiation (from infrared to hard X-rays) of several hundreds or even a million electron-volts in energy. Using hard X-rays, the properties of the active metal centers in the catalytic converter and their interactions with the gas molecules can be observed. Two methods may be applied: (i) X-ray absorption spectroscopy (XAS) allows the determination of oxidation state and coordination number, i.e. the number of nearest neighbors of an atom; (ii) X-ray emission spectroscopy (XES) which can be used to distinguish between different molecules adsorbed on the catalytic converter. On this basis, it can be concluded which molecules cause reduction, when competing adsorption takes place, i.e. if several substances compete for adsorption on catalytic converters, and how individual molecules coordinate on the metal atom. A group of researchers headed by Professor Jan-Dierk Grunwaldt, Professor Christoph R. Jacob, who recently moved from KIT to TU Braunschweig, and Dr. Pieter Glatzel at the European Synchrotron Radiation Facility (ESRF) in Grenoble / France now for the first time have combined the above methods to study under close-to-reality conditions reactions on two catalytically active materials applied in vehicles, namely Fe-ZSM-5 and Cu-SSZ-13. Both are based on zeolites, i.e. special minerals of porous structure. The results of the study are presented in the journal Chemical Communications ("Structural snapshots of the SCR reaction mechanism on Cu-SSZ-13"). With the help of the X-ray methods, the researchers studied and compared the interactions of the pollutant molecule nitrogen monoxide and the reducing agent ammonia with the iron and copper centers. "Although the reaction is the same in summary, we observed different reaction paths for the two catalytic converter materials," Tobias Günter, doctoral student at the Chair for Chemical Technology and Catalysis, reports. The scientists found that the reaction on Fe-ZSM-5 is based on adsorption of nitrogen monoxide via a positively charged oxygen atom. The Cu-SSZ-13 catalytic converter, by contrast, did not exhibit this behavior. As no direct coordination via the nitrogen atom took place, the researchers assume a reaction from the gas phase with a potential activation on the ammonia molecule. "This also explains why ammonia inhibited the reaction on Fe-ZSM-5 contrary to Cu-SSZ-13," Tobias Günter explains. The findings of the team headed by Jan-Dierk Grunwaldt provide valuable information for models to better predict the behavior of catalytic converters in operation. "Our approach based on the two X-ray methods cannot only be used for the materials mentioned, but may be transferred to many other materials and reactions," Professor Grunwaldt says. 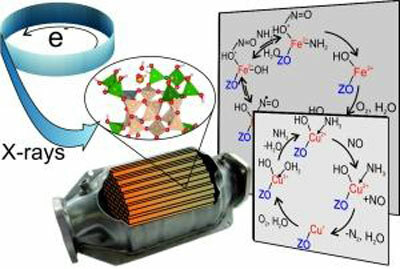 In the future, this approach will push the further development and improvement of catalytic converters.